SinglePoint Communications will be a resale partner of DoubleMap in North America. 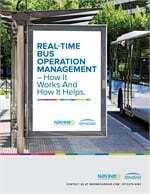 The DoubleMap solution will be used to power SingleTRAK,SinglePoint’s software that provides real-time bus and train location details via the passengers' Web browser or handheld device. Both SinglePoint (5564) and DoubleMap (5665) are at EXPO.